In addition to Firefox Quantum's new features, Mozilla made a move to replace traditional add-ons with web extensions. Having the right extensions installed can significantly improve your productivity, but also your overall web browsing experience. 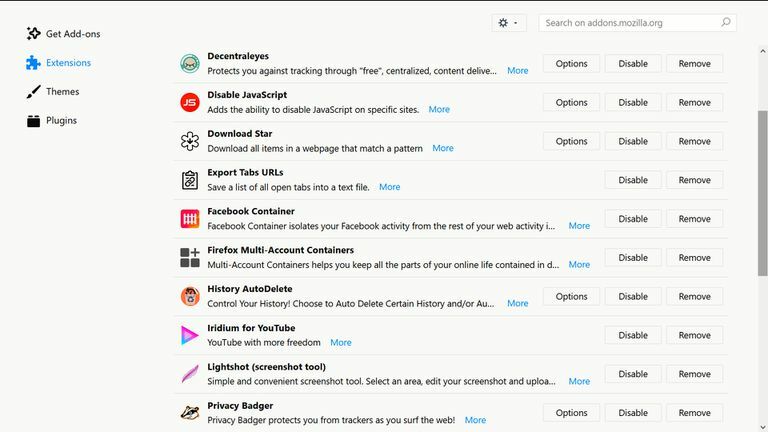 Below are 20 of the best Firefox add-ons and extensions for Firefox Quantum that cover security and privacy, productivity, ergonomics, tools, and more. The Lightshot web extension for Firefox Quantum takes and edits screenshots, right from the browser. Screen captures are saved locally or to Lightshot's free cloud storage. Good variety of editing tools. Grabbing the entire screen sometimes takes a second adjustment. Privacy Badger blocks online trackers intuitively by learning which sites are tracking you while you browse. By default, the extension will block any trackers that don't abide by the do not track signal sent from your browser. Blocks trackers without breaking most sites. The extension learns when to block intrusive trackers. Not all types of trackers get blocked. The extension requires a bit of initial configuration. With uMatrix, you can choose to block or allow various web scripts, ads, iframes, etc. You have full control over what requests your browsers allows or denies. A useful tool for full privacy control. You get to choose which scripts run. The user interface and options are for intermediate to advanced users. History AutoDelete gives you the ability to delete the history for specific domains automatically. You can also remove older browsing entries by a specified number of days. Reliably auto deletes your browsing history. Scrolling performance can be affected. The Cookie AutoDelete extension automatically removes cookies from the tabs you close, as well as deletes all cookies for a specific domain. Cookie AutoDelete also supports container tabs in Firefox 53 and up. Good white and greylist options. Deleting cookies from containers may be confusing. Video DownloadHelper gives you the power to download online videos (your own of course), in a variety of popular formats, directly from Firefox. VideoDonwloadHelper supports a large list of video sites; YouTube, DailyMotion, Vimeo, Facebook, and Periscope to name a few. Straightforward user interface and functionality. Sometimes the extension doesn't recognize HD availability. Additonal software may be required for full use of features. Dark Reader's primary purpose is to reduce the harshness on the eyes caused by bright color schemes found on some websites. You can adjust the brightness, contrast, and font, as well as use an ignore list. Reduces stress on the eyes when reading in low light settings. Some browser icons can be difficult to see. View, export, or copy the URLs of all your open browser tabs. You can include the page title along with the domain, and the exported file comes with a timestamp. Easy enough for anyone to use. Lists are limited to the current browsing window. AdNauseam is an extension built to protect your information against advertising tracking, as well as hidden malware. Ad networks like to track their users, so AdNauseam works to scramble your data, rendering it useless to said trackers. Protects your data against online ad tracking. View each ad collected in the extensions AdVault. The lack of dynamic filtering. Wayback Machine provides archived versions of pages that display 404s, DNS errors, and any other domain or web-related issues. Also, you can archive web pages by selecting the Wayback icon, as well as view the pages archived history. Good at picking up dead or non-responding pages. The extension can sometimes redirect to an archived version when there's a proper live page. The View Image web extension brings back both the View Image and Search by Image buttons in Google images search results. When the buttons got removed, many users were left frustrated. The View Image addon restores the older functionality many are more comfortable with. Brings back the view and search by image button. There are a few compatibility issues with older versions of Firefox. Download Star makes downloading items from a website a breeze. You can edit the addon's filters to specify certain types of matching files. You also have control over which files get scraped with the use of three handy buttons (links, images, and text) located in the bottom left corner. The user interface can be a little confusing at first. Smart Referer works by only sending referrer headers while remaining on the same domain. You can edit filters and create a whitelist of domains that will send referrers as usual. Can be confusing when the extension icon is greyed out. Reverse Image Search adds an option to the context (right-click) menu to search for the origin of an image. The extension uses TinEye, SauceNAO, Google, Yandex, Bing, and IQDB, with the option of setting up custom search engines. Some compatibility issues on mobile versions of Firefox. The ScrollAnywhere web extension gives you a lot more control over your scrolling. Manipulate the scrollbar with your middle mouse button without actually using the browser's scrollbar. There's an option to enable infinite scrolling, as well as the ability to change the cursor mid-scroll. The Extension makes scrolling long form pages a breeze. The momentum feature is fun. The addon doesn't function on browser configuration pages such as about:config. Will not function in PDF view. Iridium lets you customize your YouTube viewing experience with a wide variety of extra features. You can set the extension only to permit ads from your subscribed channels, as well as make the video player fit the full screen. You can stop entire channels from displaying in your suggestions. The option to disable 60 fps/frames per second. Videos freeze on rare occasions. Simple and easy to follow options. Knowing which JS to avoid or allow can be confusing for beginners. Multi-Account Containers keeps your online identities separate from one another. You can stay signed into multiple accounts at the same time, and your cookies get compartmentalized by containers. Streamlines browsing by allowing simultaneous logins. Functionality can be limited when browsing in private mode. It's pretty obvious Facebook tracks their users' browsing patterns when signed in. Facebook Container segregates your web activity from your Facebook account and eliminates any tracking. Seamless and smooth integration with Firefox Quantum. Can cause issues when using Facebook to sign into other accounts. Undo Close Tab is a simple yet effective extension that will bring back any tabs you accidentally close. You can also access twenty-five of the most recently closed tabs, all from the extension's handy toolbar. The extension blends nicely with other add-on icons and toolbars. The dark icon can be a little tough to see when using dark browser themes.